About 20 years ago, I lived in Fukui. 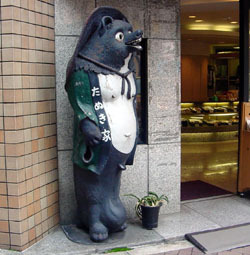 When I traveled around that prefecture, I often saw statues outside restaurants that appeared to be of giant hedgehogs. They wore traditional clothing and gave me the impression of being “overly friendly,” perhaps because of their hugely oversize testicles. (I always thought such statues would be perfect for used-car lots here in the United States: “Come on in, we would love to scr*w you!”) However, I don’t recall seeing such statues elsewhere in Japan, or in any of the “Japan Towns” here in California. What the heck are those hedgehogs? Cheryl K., San Francisco, U.S.
Well, this is going to be fun: it’s not every day I get to hold forth on zoology and male anatomy in the same column. I know exactly the statues you mean. The testicle bit was a huge giveaway, of course, but those figures are seen pretty much everywhere in Japan. The animal depicted is not a hedgehog — it’s a small mammal called a tanuki. Getting the correct English for that turned out to be tricky. I had always thought it was “badger,” but in the course of researching your question, I found out that the badger is a different animal. I also learned that what has been called “tanuki” has changed through history and varies by region. But to keep things simple, I’ll focus on the animal most Japanese would identify as tanuki. Now that we’ve got classification covered, let’s move on to anatomy. I’m not quite sure how to break this to you, Cheryl, but you’ve got your body parts mixed up. Having conducted dozens of intimate examinations on actual tanuki statues, I can state with authority that it’s not the testicles (kogan) that are oversize; it’s the scrotum (inno). Furthermore, it’s only in statuary that tanuki carry a lot between the knees; the scrotum of the living animal is proportionate to its body size, which is to say no bigger than your pinkie. 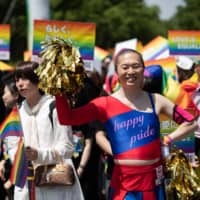 Knowing there must be a reason behind such pervasive embellishment, I got in touch with Kazuo Iihara, a professor at Tokushima Bunri University on Shikoku Island who has written extensively on Japanese legends. I wasn’t sure how to bring up the testicular topic, particularly on the phone, so I tried to ease into it by relaying your impression that tanuki are “overly friendly.” But Iihara was quick to dismiss any association between the enlarged scrotum and special sexual powers. I got off the phone (fast!) and settled into the library, where I eventually came across what seems to be the most accepted explanation for the king-size nut sack. In his book “Hagane no Chishiki, (Knowledge about Steel)” (Diamond Shakan, 1971), Shigeo Okuwa traces the super-size scrotum story to metal workers in Kanazawa Prefecture. To make gold leaf, these craftsmen would wrap gold in a tanuki skin before carefully hammering the gold into thin sheets. It was said that gold is so malleable, and tanuki skin so strong, that even a small piece could be thinned to the size of eight tatami mats. And because the Japanese for “small ball of gold” (kin no tama) is very close to the slang term for testicles (kintama), the eight-mat brag got stuck on the tanuki’s bag. Soon, images of a tanuki began to be sold as prosperity charms, purported to stretch one’s money and bring good fortune. Most tanuki statues are Shigaraki-yaki, a type of ceramic ware made in and around the town of Koga in Shiga Prefecture. According to the association of local pottery manufacturers, the now familiar design of a cheerful, slightly goofy-looking tanuki, often carrying a flask of sake, was developed by Tetsuzo Fujiwara, a potter who moved to the area in 1936 and devoted the rest of his career to tanuki statuary. In 1951, on the occasion of an imperial visit, the town prepared a special row of flag-waving tanuki statues. Emperor Hirohito was so charmed by this welcome that he penned a poem about it. That was a story the media couldn’t resist, and the resulting publicity contributed greatly to the popularity of the statues. 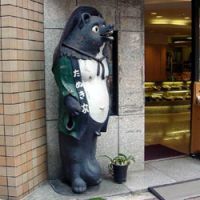 The most common place to see a tanuki statue is in front of restaurants and shops, where they’re placed to lend some traditional atmosphere and invite success in business (shobai hanjo). To see how the statues are made, take a look at the Web site of Maruichi Okada Ceramics. A series of photographs beautifully illustrates the process. Tanuki statues come in a variety of styles and sizes, ranging from minis to the massive No. 55, which stands as tall as a man at 162 cm, with a price tag to match (¥787,500). Scrotal size varies depending on design. 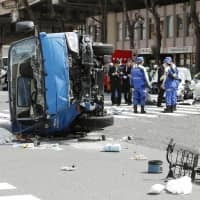 And should we have any readers who own used-car lots, company president Yozo Okuda says he’ll ship anywhere in the world.